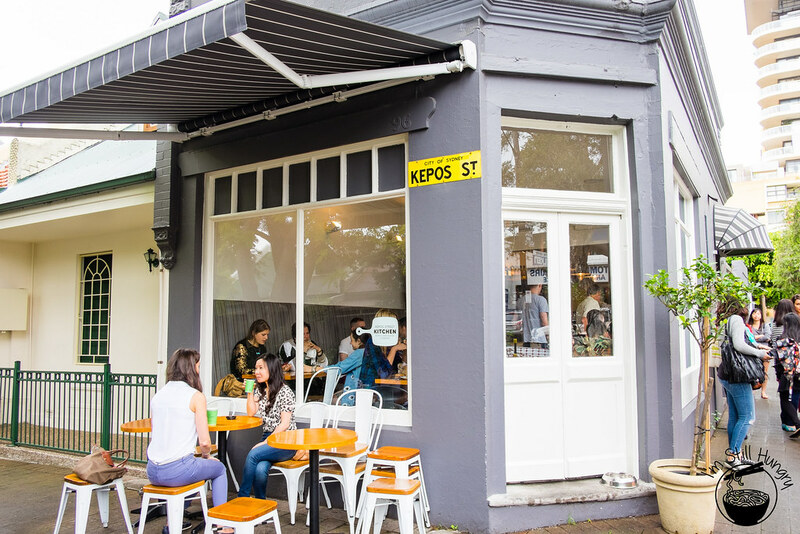 There’s an easy way, and a hard way to introduce Kepos Street Kitchen. 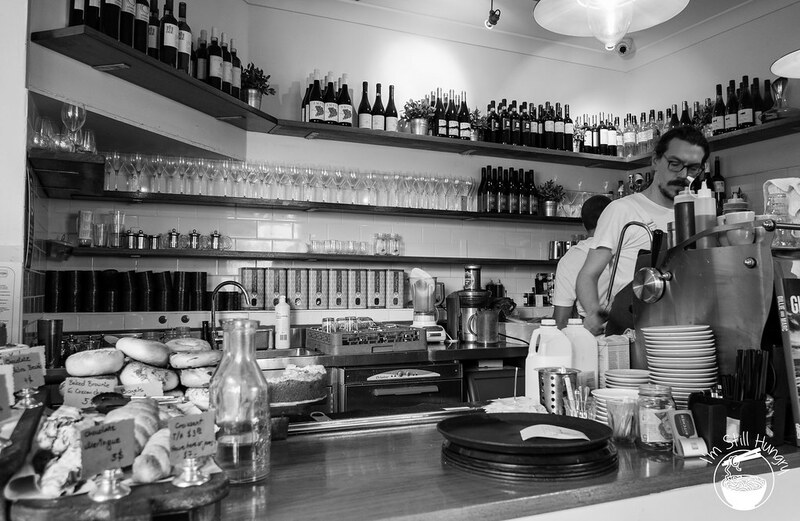 The easy way is that it’s my favourite café in Sydney. Well that was easy. The hard way? That’s to explain why it’s my favourite cafe. Opened in November 2012, so KSK isn’t even two years young. 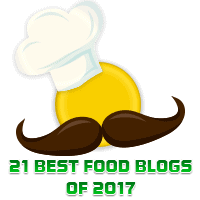 Yet, it’s already earned a chef’s hat, making it one of only a handful non-fine dining establishments to do so. I vague recall predicting, somewhat smugly, that KSK will receive a chef’s hat after my first visit. Yes, the food is most toque-worthy, café or not be damned. 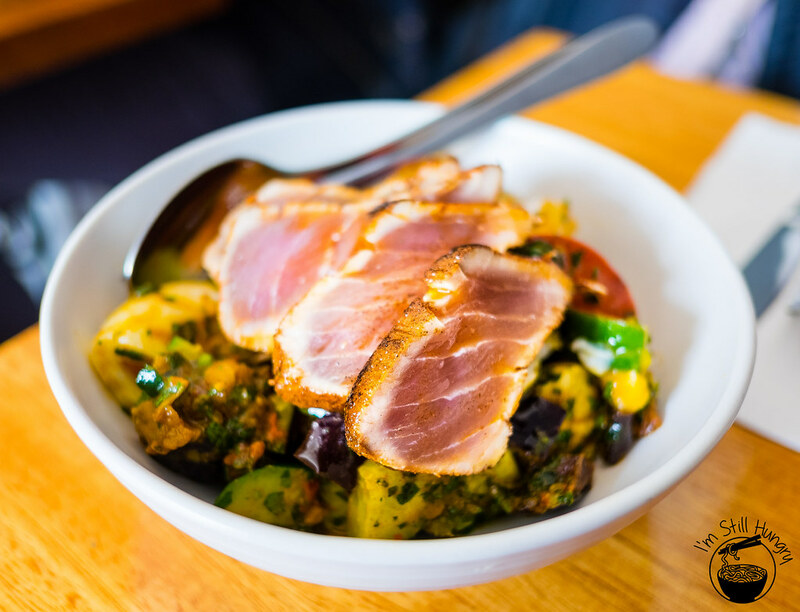 KSK’s owner, Michael Rantissi, possesses experience as sous chef @ The Bathers’ Pavillion, and possesses a Middle-Eastern cooking repertoire that’s richly ingrained in KSK’s fare. It’s delicious, and you will queue for it. Thing is, you won’t mind, after you’ve had a taste. So, about that queue. It’s inevitable – even if you arrive at 8:30am (yes, I can confirm this first-hand). That hatted status, the double-edged sword it is. A supplementary explanation is that the cafe itself is quite small – it only has room for around 10 tables before getting way too cramped. This is something to live with. Luckily, it’s very easily recognisable, and parking should be readily available, with the possible exception of weekends. 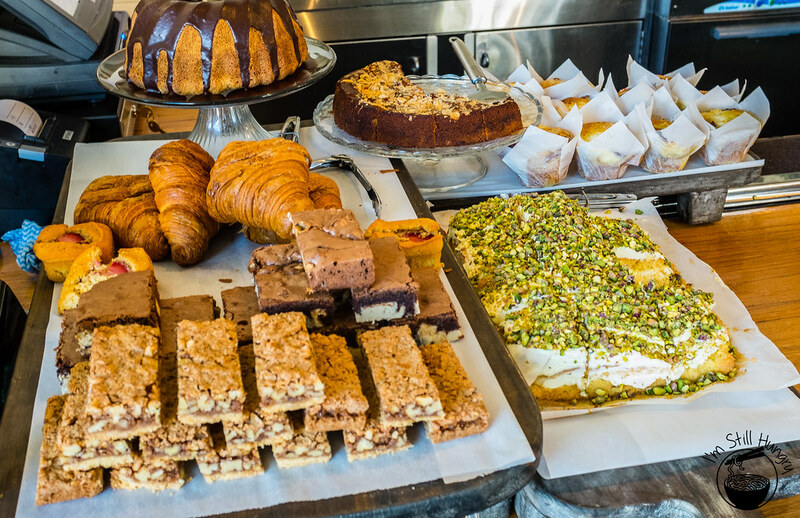 All kinds of pastries – always changing! A cafe with a Middle-Eastern bent is not a common one, and I never would have been able to guess how such a concept could have worked. 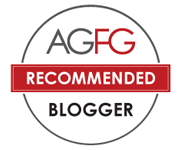 This primarily demonstrates just how little I know about food and how much there is to learn. Thus, knowing that Kepos Street Kitchen isn’t your standard-fare was nearly as exciting as eating there. 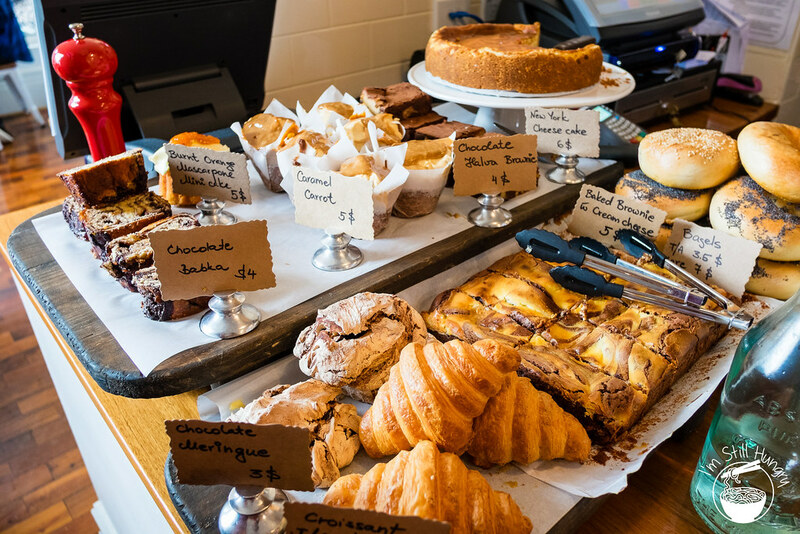 Like most cafes, KSK has a range of pastries/baked goods for instant sale. The above was what I was privy to on my latest visit. As you can imagine, pastries take on a more Turkish bent. In fact, we were curious enough to buy the chocolate babka, a kind of chocolate scroll cake. It was the perfect fill in while we were waiting in the queue. Speaking of that wait – it was around 30 minutes. The good news is that you can leave your number with them and saunter off somewhere else, knowing they’ll call you back. See, drastically different. Good stuff. What you see above were the pastry options available on our first visit to KSK over a year ago. 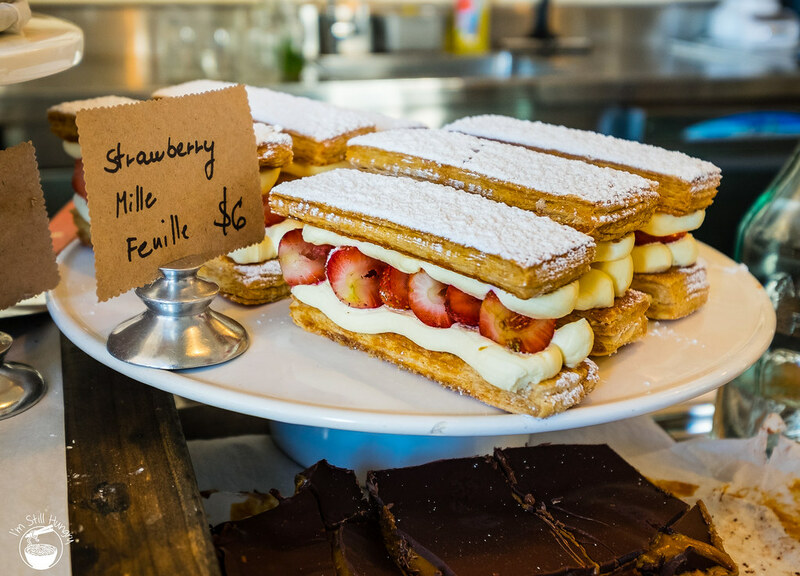 Apart from the cafe stalwart – the croissant – almost everything changed! Keeps you coming back. Final notes on the location: boy, I only wish it were close to home. If I lived in Redfern, I would visit it monthly. That may still sound limited, but for someone who rarely goes to the same cafe twice thrice (even if I really like it), it’s a statement. Be warned that KSK does not serve all-day breakfast, so choose your option wisely. Both menus are available on their site to assist in your informed choice. The next few pictures are from the breakfast menu. Luckily, coffee is all day. KSK makes a great coffee, sourced from The Grounds of Alexandria, so you’d expect this. It doesn’t disappoint, but I don’t speak for the connoisseurs. 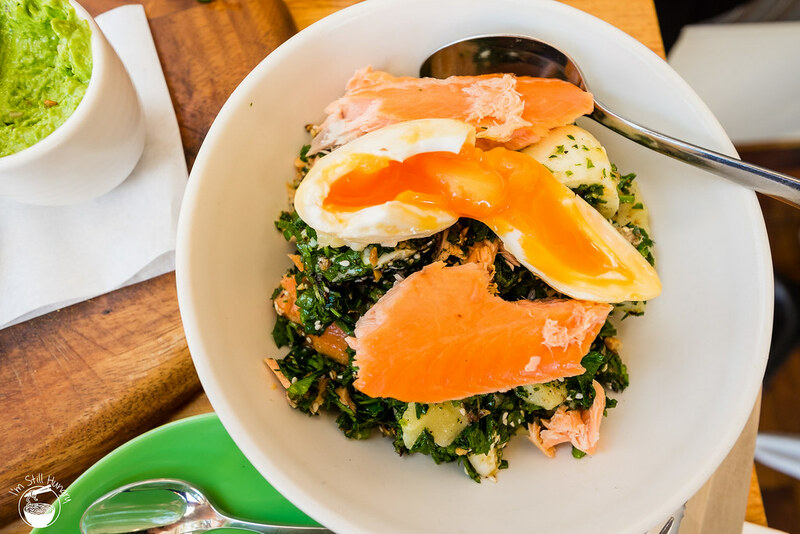 For a lighter approach to breakfast, you can’t do much better than the wood-fired smoked salmon salad. Crunchy textures marry extraordinarily well to perfectly smoked salmon pieces. Needless to say, poached eggs don’t get much better. It’s a simple dish, but is both flavoursome and texturally interesting. That’s a perfect breakfast dish already. The first time The Lady tried it, she remarked that there were too many potatoes in it. Since my third visit (see end of post), the amount of potatoes has significantly reduced. A good sign! 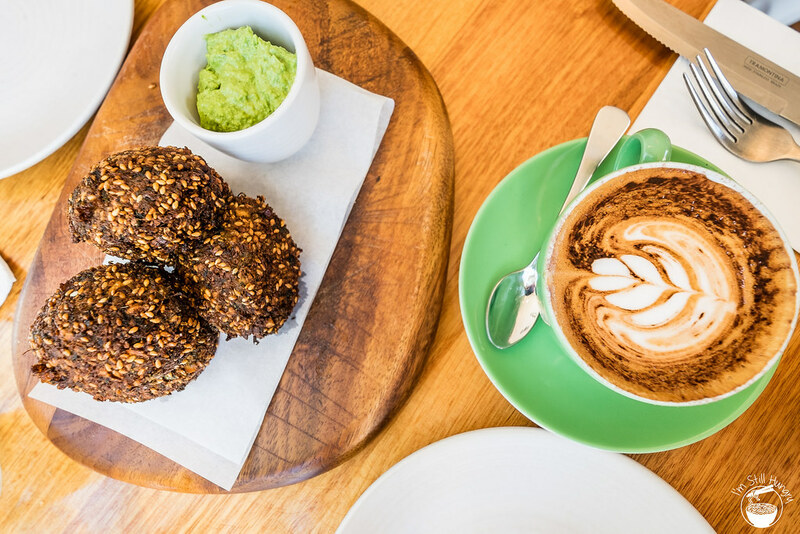 For the sharers or those who have a larger-than-life appetite, you should give dad’s favourite brekky a try. Michael takes some cues from his upbringing, and reproduces what I personally consider the “signature breakfast dish” at KSK. Guess what, it’s also completely vegetarian. Did I mention that KSK is vegetarian-friendly? Audience expanded! This platter has everything you could want with the exception of meat. Bread to mop up the best cafe hummus you’ll ever have? Yes. 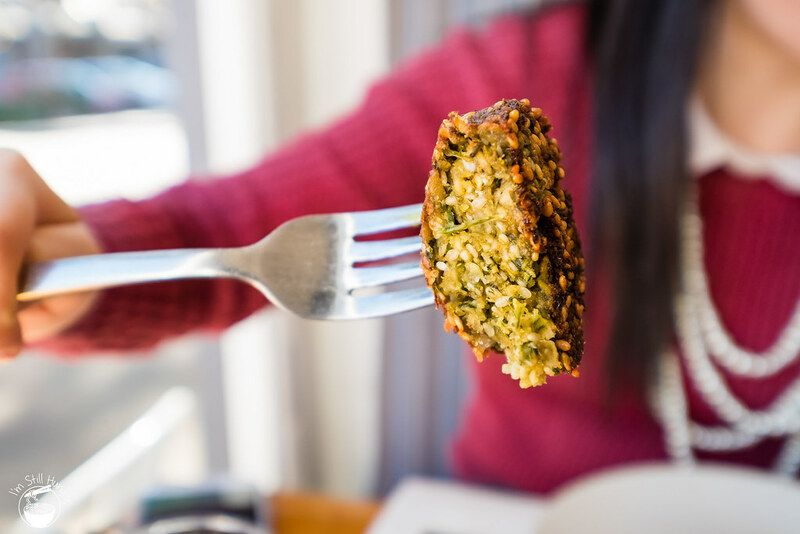 Delicious falafels that are served hot, a glorious taste sensation? Absolutely. 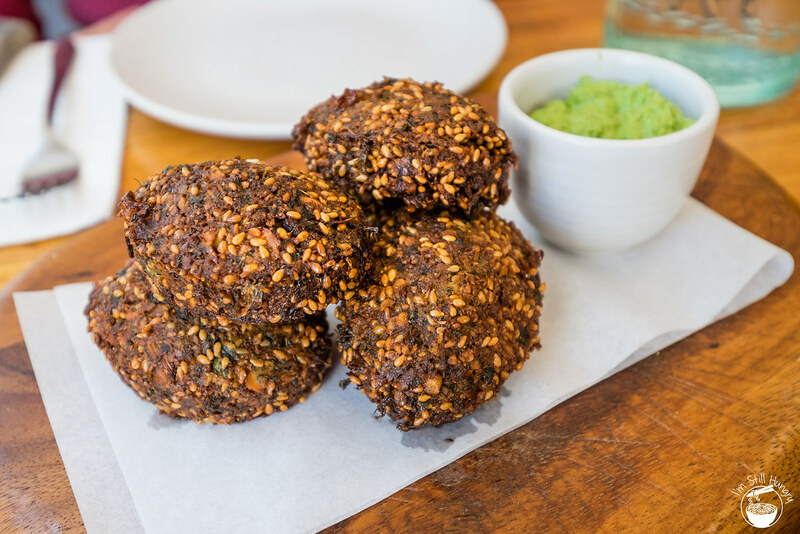 Chuck in some crunchy & spicy dukkah and we’re there. The falafel is friggen awesome. The best I’ve had. It’s hard for things to get better, but this is where things get serious. The bacon brioche roll w/KSK chilli jam is probably the most-Instagram’d dish at KSK ever, and with good reason. This thing is a monster, in all the good ways a monster roll can be. I would order this one every time I could. That was breakfast at KSK and I’m already floored. Onto the 2nd (lunch) visit. 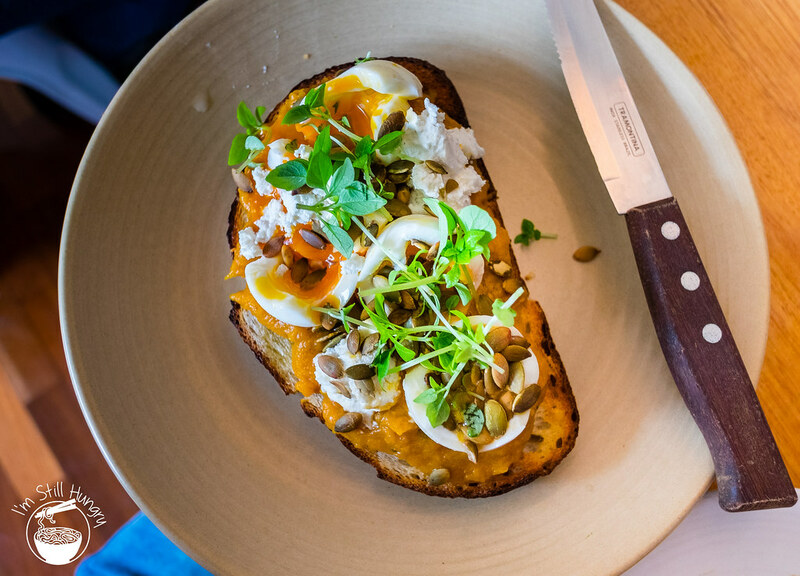 More a breakfast dish, but making its way onto the lunch menu instead, the vegetarian pumpkin bruschetta was the most surprising lunch dish. Surprising, in the sense that I didn’t expect it to be any good, but KSK cut through my expectations like a bespoke Japanese knife through butter. I maintain that this dish should be shared, otherwise it does get boring, but as a half-portion, it’s exactly what the doctor ordered. Start with a great foundation – the bread, naturally. Layer on top the most delicious, creamy-sweet pumpkin mash you can get. 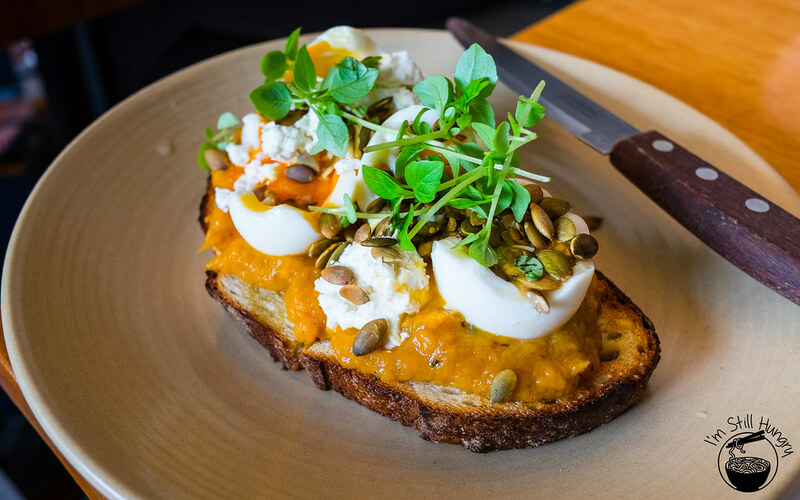 Toss on the roasted seeds of said pumpkin, garnish with cheese for punchy flavour, slice up some eggs and you’re good to go. It is really good. Great for both breakfast and lunch, I reckon. 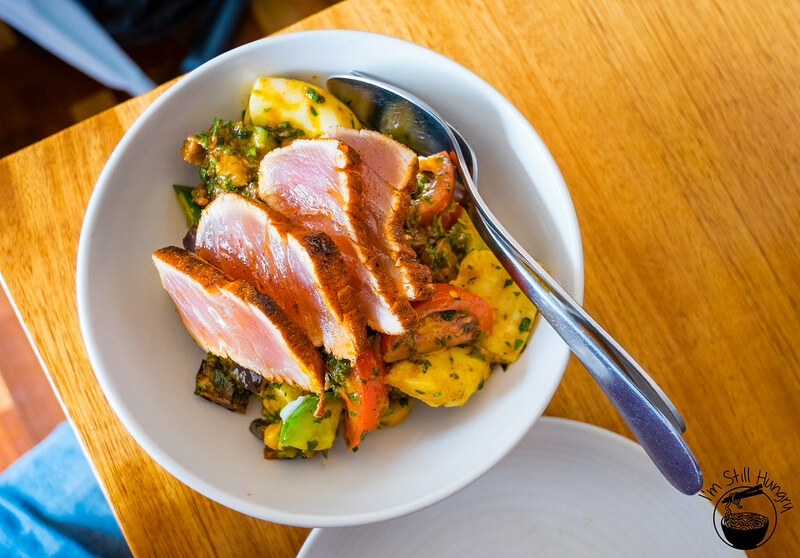 After seeing the seared yellow fin tuna dish crop up on Instagram now and again, I decided to succumb to my tuna bias and go for it. Besides, it would once again be a unique departure among cafe dishes. Turns out the way KSK does it is with an old fashioned searing, but with its own mediterranean spiciness in the lovely form of harissa. The tuna is freaking delicious, as you can imagine. Seared (or ‘aburi’ in Japanese) anything is good, and tuna is a prime example. I hear that harissa sauce is a good “starter sauce” for people who want to get into chilli. For me, that means I can barely taste the spice. That’s fine though – harissa is flavoursome enough that it makes a great condiment. My first time having it on tuna – and it works a treat. My second favourite part of the dish? The potatoes! Boiled and chopped up such that it almost tastes creamy, but retains its chunky structure. Oh so good. D’you know what else wins? The eggplant! Actually, how about the whole dish. Yeah, that’s easier. 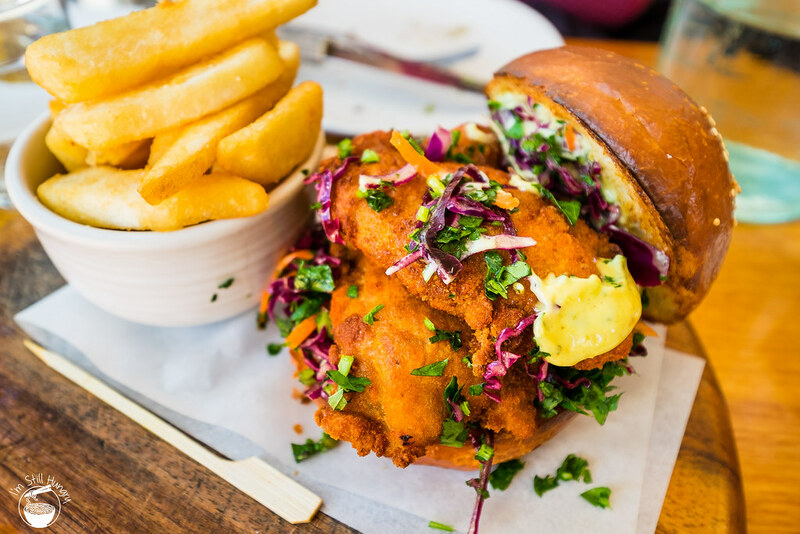 Our lunch was originally going to just be the above two dishes, but when I saw the southern fried chicken sandwich go out to another table…well, I think you and I can agree why I told my stomach to calm down and got this little (i.e. huge) sucker. 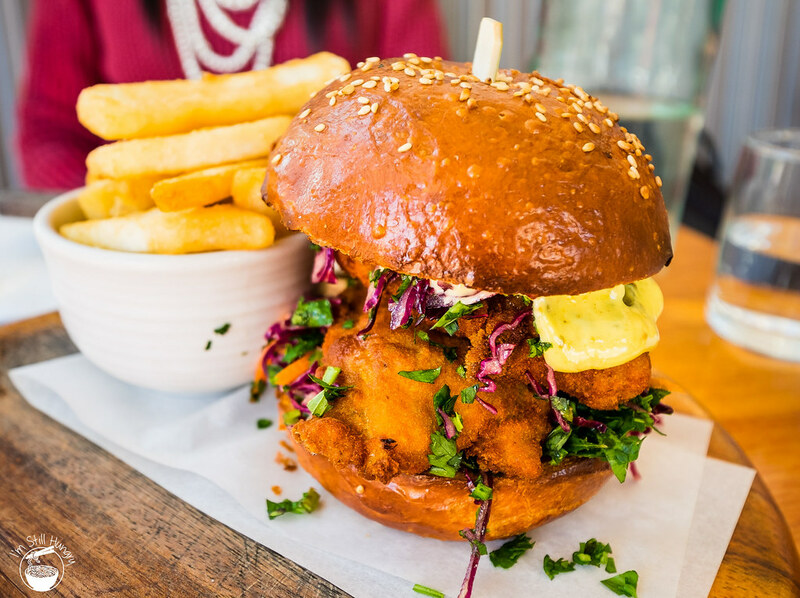 Seems like KSK is on the ball with their burgers as well – sweet brioche bun, so much succulent, crunchy chicken, delicious slaw & mayo. Last but not least, delicious thick cut chips. Serving suggestion: as you get two pieces of chicken, break the burger up in half so you get two lots of bun + chicken. There’s plenty of slaw & mayo to go around after that. You’re welcome. So to wrap up why I love KSK so much: I’ve had the fortune of sampling 6 dishes here, plus a pastry and their coffee. The prices are great, the service is within norms but most importantly, not a single dish ever disappointed. Strong skim cap sourced from The Grounds of Alexandria – no skimping on quality allowed at KSK. I found that this second instance of this dish contained fewer potatoes (a good thing – the first had too much), but was a bit more oily and salty. Hi Nicola, unfortunately I’m not positioned to answer your question, as I haven’t eaten at either Kepos venue at night. Additionally, I’m not fairly sure Kepos St Kitchen doesn’t even do a night service. 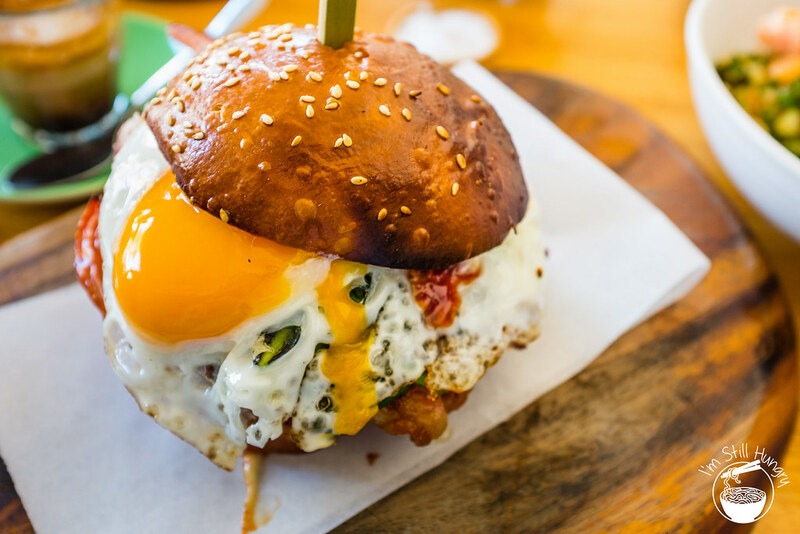 I love the shot of the burger – beautifully composed! Your making me hungry now. Heavy breathing…. 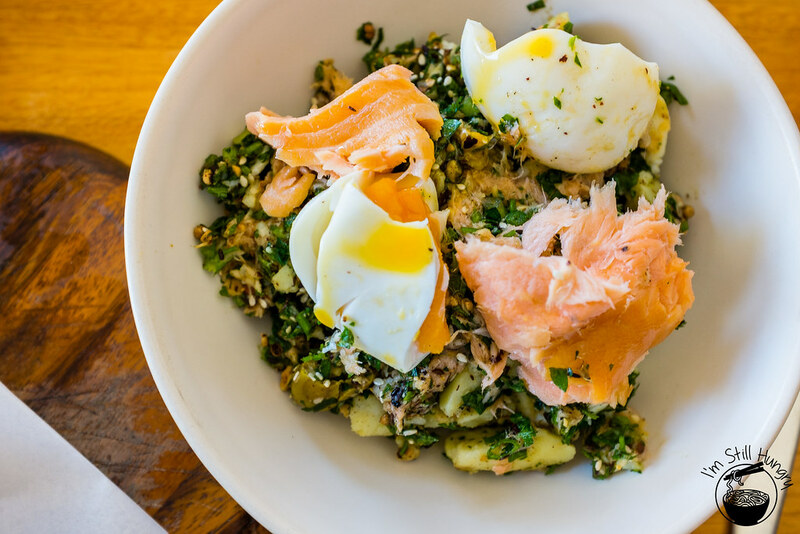 😛 I want to try the ood smoked salmon salad! i had the pumpkin bruschetta and loved every single bite of it. so damn delicious! I didn’t like it enough to eat the whole thing, but yes, it definitely is delicious. 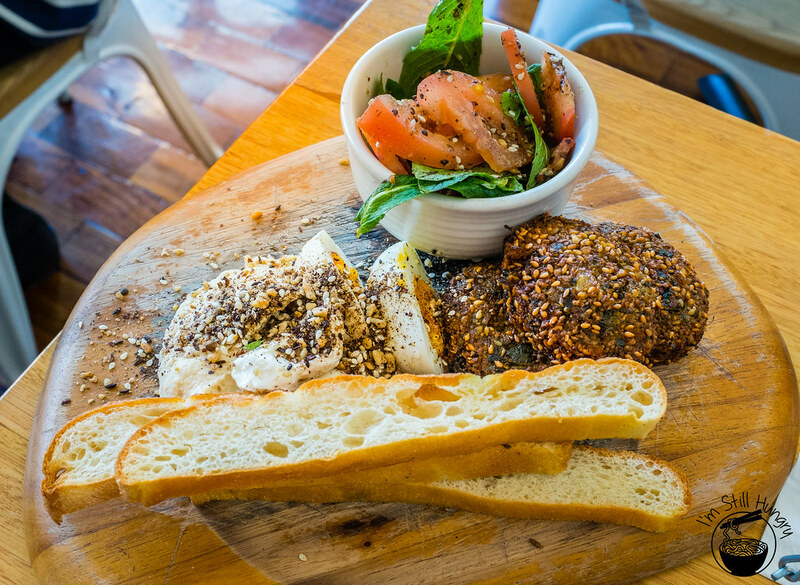 the dukkah in the smoked salmon salad is so addicting :O and I love the chicken burger too, super scrumptious! nom nom. The crunch, it’s so good isn’t it! Now to try the wagyu burger mmm mmm. Tastiness of the food at KSK is directly proportional to the queues outside it. Come on a weekday for some seriously reduced wait times. I haven’t been there yet! 🙁 But I definitely want to! The ‘Beast’ certainly looks very tempting! Definitely give it a go. I cannot recommend a café more than KSK. Trying them tomorrow; I hope it won’t be too cramped! But wow, everything looks good I don’t even know what to try first! As always, outstanding pics, Michael! Given it will be a Thursday, you should be fine? Depends on when you go – my last visit was on a Wednesday at around 12pm – it was fine at that point. Three visits allows me to sample quite a few delectables! The downside is that in my three visits spanning 1.5 years, their menu hasn’t really changed. Still, not an issue if you’ve yet to visit. One of my favourite cafes in Sydney. 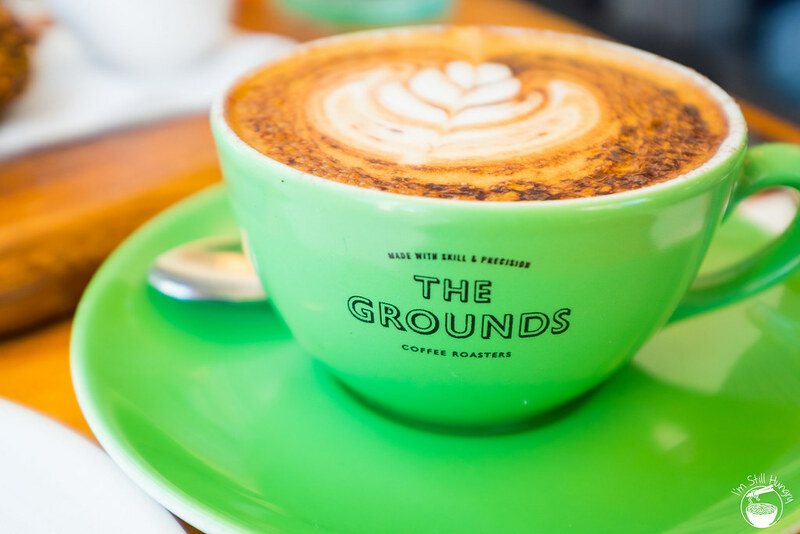 Not a fan of The Grounds coffee beans but the Barista at Kepos makes it enjoyable. Their bacon & egg roll is one of the best I’ve had. Gotta try the fried chicken burger next time! Beautiful photos dude! 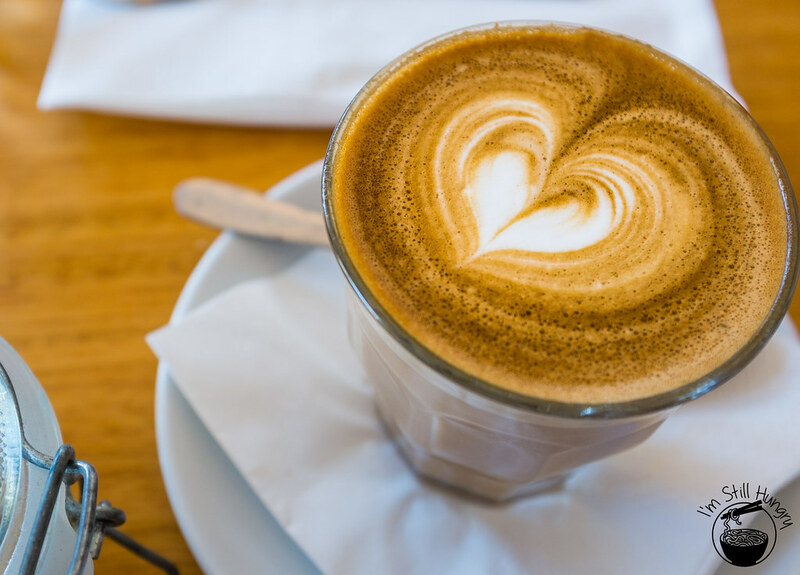 You definitely know your coffee Raff! I’m just happy it isn’t a bitter, dry mess haha. 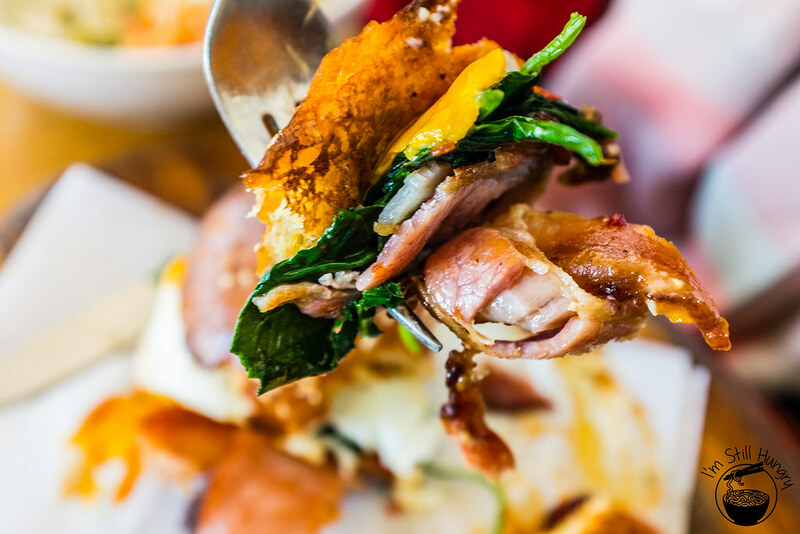 But yes, that bacon roll…finger licking. 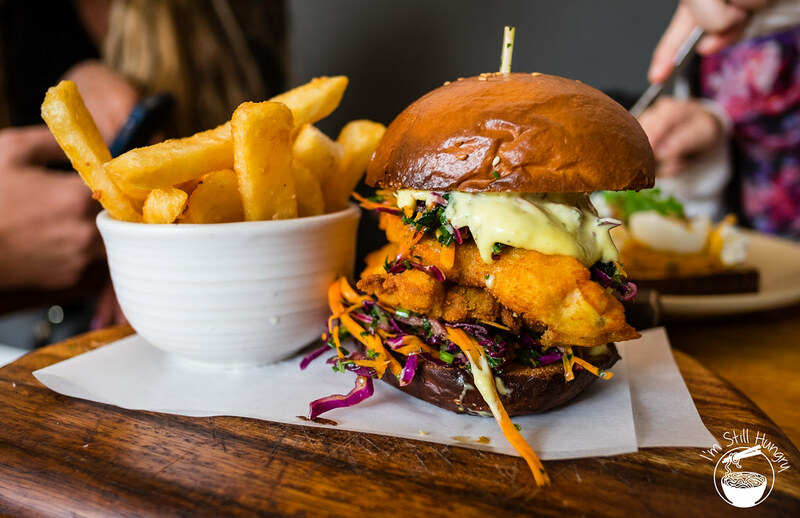 The chicken burger? Take both hands bro! OMG, as a sucker for pumpkin, the pumpkin bruschetta had my heart skipping a beat. Need to visit asap! yum.. your making me hungry! love the post + great photography too – will definitely have to check this place out. thanks for sharing another great find! Thanks Thalia – KSK simply sells itself with how tasty its food is. Do visit, but try and avoid the peaks! Probably one of the best chicken burgers I’ve ever had. So darn good, the falafels too! i want everything but that selection of baked goods looks amazing! And it keeps changing – you’ll never get bored! i love the falafel! 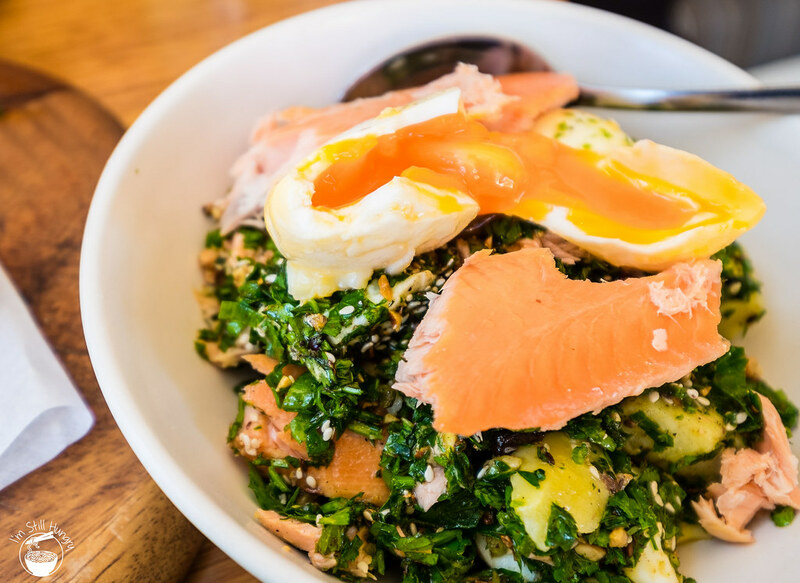 have only been here for brekky, but the lunch options look fabulous – as do the sweets! 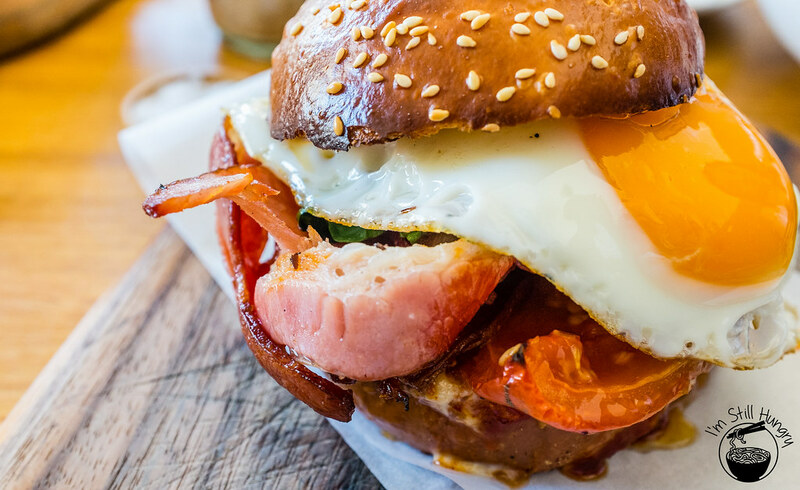 I need to go back for brekky – really craving that bacon brioche roll again. NEED. 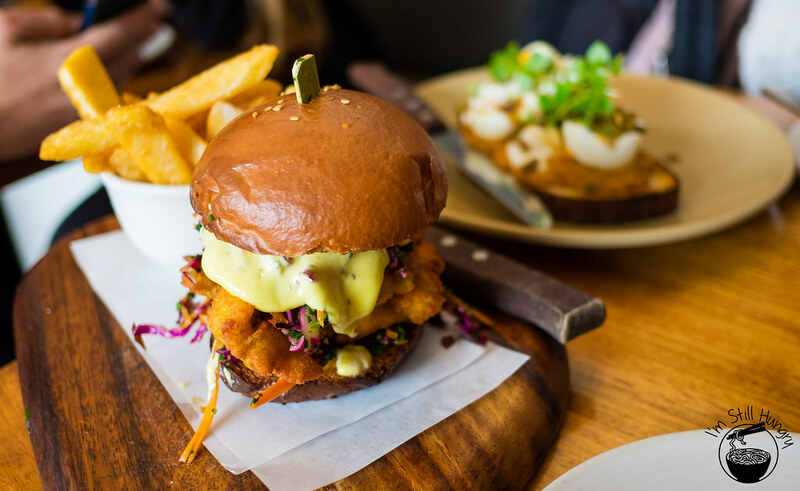 They’ve got something for everyone – even vegetarians! Such is the beauty of a Middle-Eastern menu. 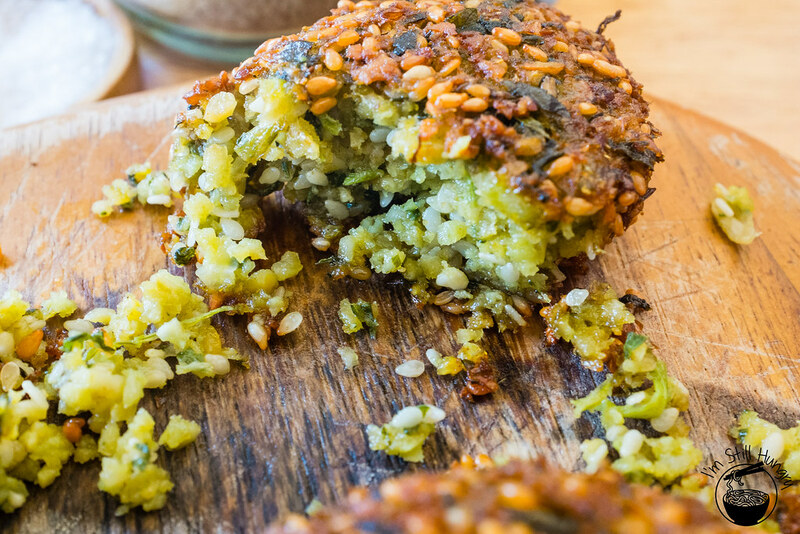 That falafel looks incredible, but really I can’t stop staring at that bounty of baked treats! What to choose? One of everything please! They keep changing too! You’ll never, ever get tired of it – one of everything sounds just about right!